FILE - Women and children return home with plastic containers of water, in a section of the sprawling complex of mud-brick houses and tents that makes up the Bidi Bidi refugee settlement in northern Uganda, June 9, 2017. The United Nations and donor partners in Uganda are demanding accountability after claims money meant for refugees was being pocketed by Ugandan officials. Though the country has been praised for its open door refugee policy, claims of corruption now under investigation taint this image. Uganda is home to more than 1.3 million refugees, a majority from South Sudan. Ugandan officials at the ministerial office responsible for refugee affairs have been accused of a range of offenses, including, fraudulent food distribution, fraudulent refugee lists and forcing refugees to pay bribes to get registered. The irregularities were discovered after U.N. partners followed internal procedures and demanded an expeditious investigation. A team of investigators from the World Food Program are reportedly in the country to support the investigations. Ugandan Prime Minister Ruhakana Rugunda, however, downplayed the scandal, calling it a small issue that will be handled. "It's true there have been some report that there may be ghost refugees," he said. "Government last week instituted a team from the CID [criminal investigations department] to investigate the matter. We are expecting the report and we will deal with it." Rosa Malango, the U.N. resident coordinator for Uganda, expressed concern, saying the rule of law must be followed to ensure those responsible are brought to justice. "The work that we are involved in, the resources that we are talking about; touch human lives," she said. "So it is absolutely unacceptable that any of these resources should be misused. This is not just about human resources; this is also about human dignity. We've heard about allegations of abuse of women and girls. And it's absolutely fundamental to make sure that we do everything in our power, collectively to protect women and girls, whether they are citizens or refugees." 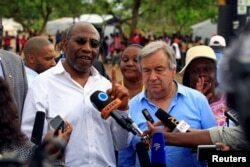 FILE - UN Secretary General Antonio Guterres (L) and Uganda's Prime Minister Ruhakana Rugunda address the media after a tour of Imvepi, where south Sudanese refugees are settled, in northern Uganda, June 22, 2017. Finances meant for refugees are channeled through the various U.N. agencies in the country and sometimes through the office of the prime minister. Some monies given to aid refugees through various agencies were allegedly given back to some officials in the office of the prime minister. Last week the U.N. High Commissioner for Refugees Fillipo Grandi sounded an alarm for $3.2 billion for South Sudan refugees in the East African region. While in Uganda, he didn't mince his words. "Whenever these allegations — and it happens — pertain to our activities or to activities of the UN — the UN has very robust systems in place to investigate and to take sanctions and [we see] this is resolved. So, on our side there is a full commitment to do that." For now, the Minister for Relief, Disaster Preparedness and Refugees has directed the Permanent Secretary in the Office of the Prime Minister to interdict four top officials as investigations continue.